Cristiano Ronaldo did not need any extra motivation as he came into the World Cup. The 33-year-old who has won every possible title in the world, except for one, knows that this is most likely his last chance to win that one and only title still missing. A World Cup can lift him to the status of Maradona and Pele in the race for best player in history, and finally put to rest that bothering issue of who is better, Ronaldo or Leo Messi. And yet, extra motivation did come just hours before Portugal’s opening match in Group B. The Spanish tax authorities announced that Ronaldo will pay a huge tax worth nearly 19 million Euros, more than 21 million US dollars, and has also received a two-year suspended jail sentence for tax evasion offenses. The Portuguese superstar has claimed for years he is mistreated by the authorities in Spain regarding his taxes, and who did Portugal face in that opening match? That’s right, their Iberian neighbors. This was, by far, Spain’s best game in the group stage. But it was not enough for a superstar on a mission, who by himself made sure this giant match ended in a 3 all draw. How good was Spain? They had possession more than 60 percent of the time, they shot more at goal, shot more at target, had more successful dribbles, and yet they didn’t win the game. “Twelve Football,” the statistics engine which ranks players during matches, naturally chose Ronaldo as Man of the Match, all the players in places 2-8 were Spanish, but even that was not enough. It seemed as though Ronaldo was overly determined not to lose to Spain, his celebrations at the end of the game showed how important it was not only for the team, but to him personally. In this game Ronaldo became the oldest player to score three goals in a World Cup match, and his 84th goal for Portugal means only one player, Iran’s Ali Daei, scored more goals for his country (109 goals in 149 appearances). Then came the second match against Morocco. It was far less impressive than the first game, but he did score an early goal with a typical header, and with the entire defense around him. That one goal was enough to secure a win. At that stage Portugal seemed to have an easy route to the Round of 16, and things looked even better as they took the lead in the first half of the final match against Iran. Until Ronaldo – who else? – had the chance to score on a penalty early in the second half. The man who scored so many decisive penalties, regardless of the event or the pressure on him, missed this one. That penalty miss cost Portugal the top spot in the group, and it could have been worse. There was plenty of last minute drama in both Group B matches – the penalty awarded to Iran and the goal awarded to Spain against Morocco were both incidents only awarded after consulting VAR. 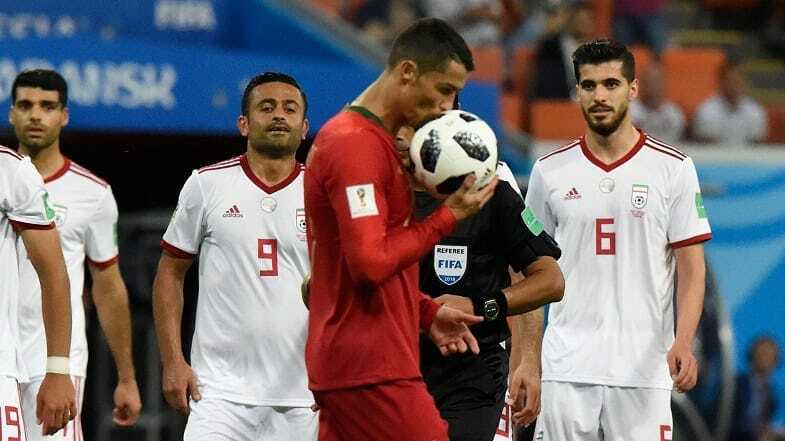 But not only did Portugal lose their top spot, they were very lucky not to lose their place in the second round as Iran missed another great chance in the dying seconds. Until that final minute, Portugal was meant to face Russia in the Round of 16, but instead, they will now face Uruguay. How will that match look? It’s quite difficult to predict. The Portuguese display slowly deteriorated as the tournament progressed. A heroic first match, followed by a decent display and a narrow win in the second and a lucky draw in the final game, should give manager Fernando Santos plenty to worry about. If the Iranians were able to embarrass the Portuguese defense, just think what two world class strikers such as Luis Suarez and Edinson Cavani may do. This is also exactly the opposite of what happened to Portugal two years ago in EURO 2016, when a very slow start led to a second round qualification – but only on goal difference – which led to an impressive run all the way to the title. And yet, is it wise to bet against Ronaldo in his last bid for a world cup title? I’m not so sure. When he is at his best he is simply unstoppable. The Spanish defense can tell you all about that. One thing that is sure, however, even if Ronaldo ever evaded tax authorities in Uruguay and even if it was for millions and millions of dollars, they will make sure not to make any claim against him. Or at least not until after their Round of 16 match on Saturday.